The PC industry is taking natural steps toward smaller, more efficient hardware, but the transition isn't necessarily good news if you're an enthusiast who laughs in the face of TDPs. If it's all-out performance you're after, you may be a tad disappointed to find that mammoth parts are becoming increasingly rare. Three-slot graphics cards longer than your forearm? CPU coolers the size of a car radiator? Chassis that can house as much power as a Death Star? Such things are these days harder to find, however there are some firms who continue to champion extreme gear. EVGA is a name synonymous with enthusiast hardware and having established itself as a purveyor of high-end graphics cards, motherboards and power supplies, the manufacturer has recently spread its wings with the introduction of gaming-focussed laptops, peripherals and chassis. 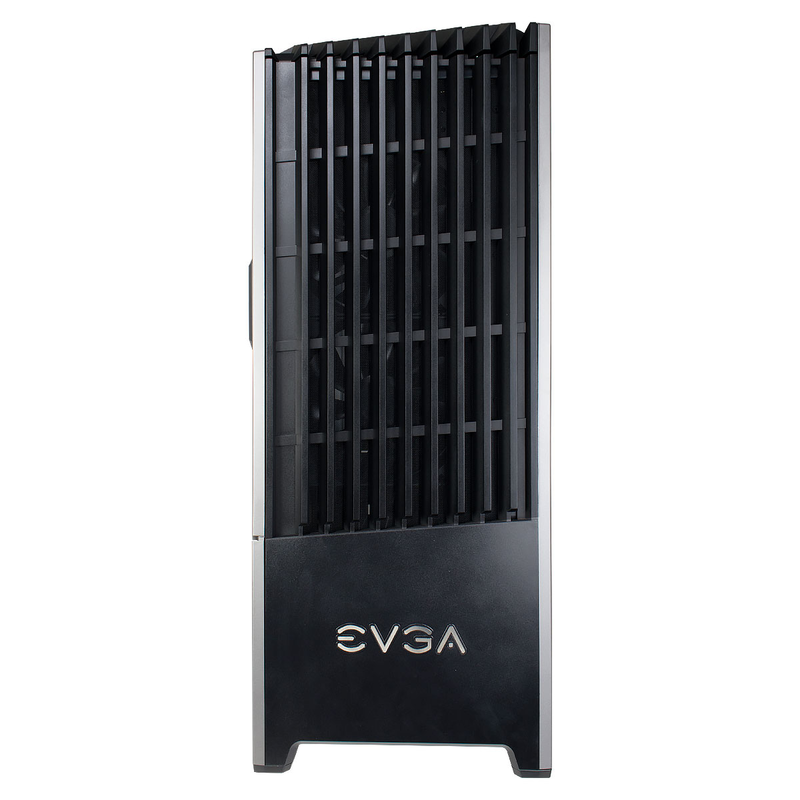 Turning its attention to the latter segment, EVGA is now gearing up to launch four full-tower solutions under the DG-8 umbrella. Four models will initially be available, the DG-84 (£150), DG-85 (£160), DG-86 (£190) and a range-topping DG-87 (£220). 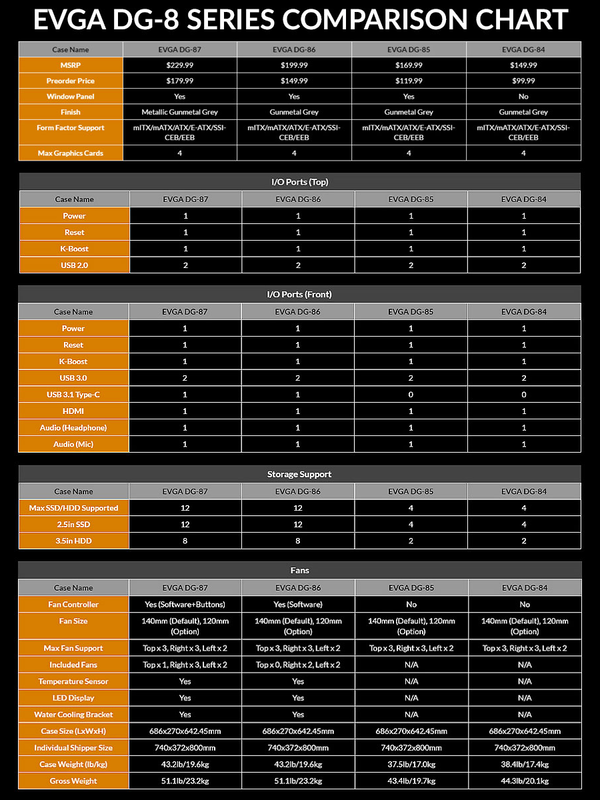 The quartet all share the same underlying frame but are differentiated through various features that EVGA handily lists in a comparison chart. Neither model is expected to reach UK stores until September, but for those of you itching to know more, HEXUS has been able to spend some quality time with a pre-production sample of the all-singing DG-87. 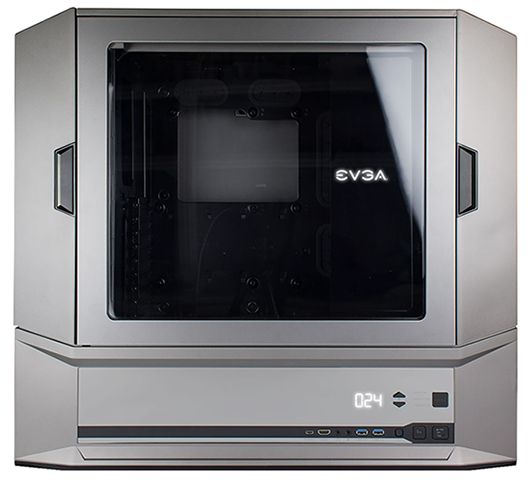 Measuring 686mm (L) x 270mm (W) x 643mm (H) in size and tipping the scales at just under 20kg, the DG-87 is no shrinking violent and EVGA chooses to take a different approach by designating the windowed panel as the front of the case. The back is now the left, the front is the right, and the unusual orientation poses some challenges with regard to positioning - particularly if you feel the need to have the front of the case facing you. It's a giant enclosure, yet rather than coming across as big or boxy, the DG-87 manages to look impressive first and foremost. 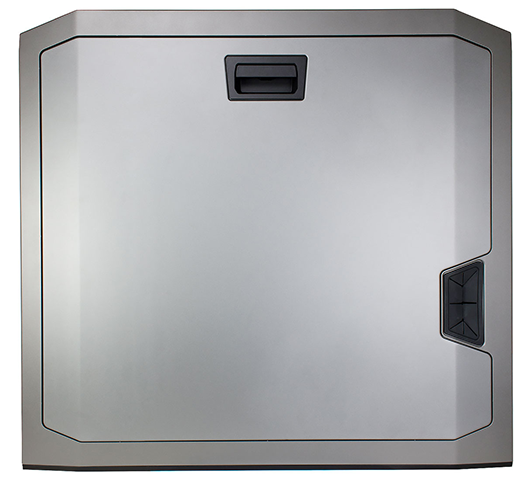 The tapered edges work nicely, as does the radiator-like trim on the top and sides, while the mirrored section toward the bottom catches the eye and includes an array of I/O ports as well as an LED display. 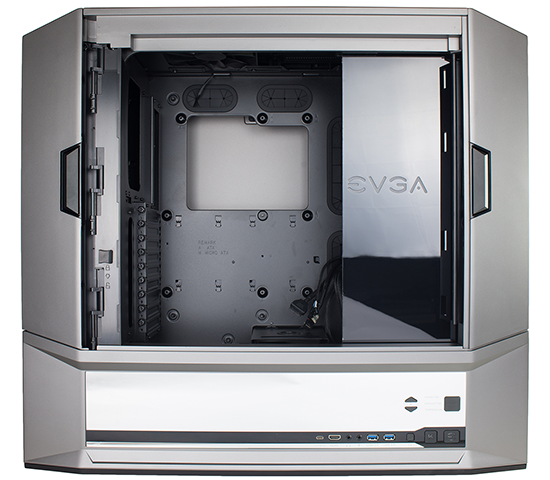 When using the case it becomes clear that EVGA has managed to keep costs down by using large swathes of plastic attached to a steel central frame, though that isn't necessarily a bad thing. An aluminium model would no doubt cost a small fortune, and for a product that's always visible and rarely touched, the DG-87 succeeds in looking more expensive than it is. The 'metallic gunmetal grey' paintwork is particularly tidy. Can a box of such proportions still be functional during everyday use? We had our doubts, but a few clever design decisions make the enclosure more practical than first meets the eye. Take, for example, the front I/O panel near the bottom of the case. It includes power and reset buttons, dual USB 3.0, USB 3.1 Type-C, a pair of audio jacks and an HDMI output whose cable is pre-routed toward the internal expansion slots. Front-facing HDMI could be particularly useful if you're looking to attach a VR headset, and the goodies don't stop there. A K-Boost button promises a one-touch performance boost (more on that later) and the stylish LED display is an elegant way to show ambient temperature or fan speed, with the latter controllable via the up and down arrows. 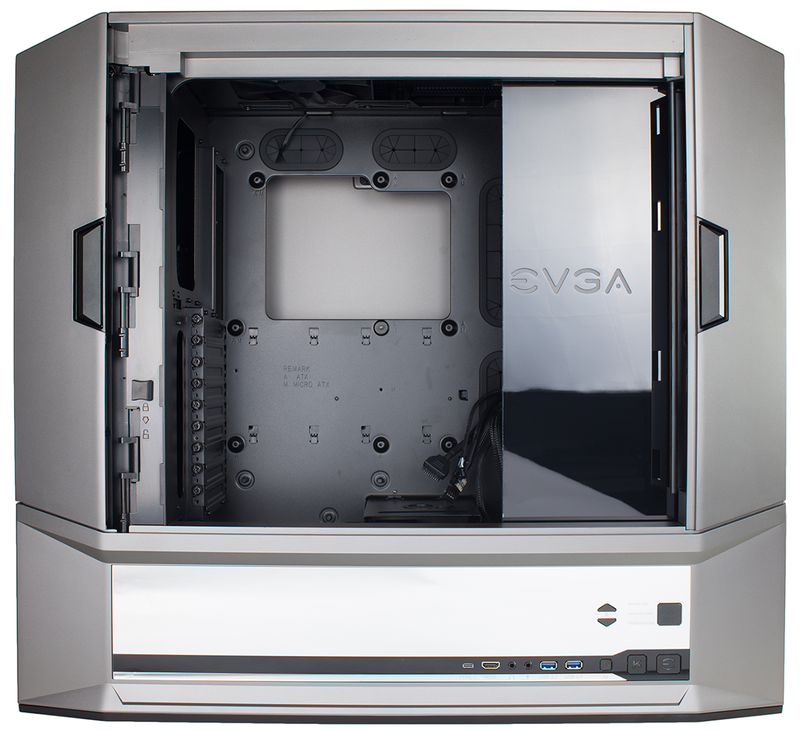 Port selection is excellent, and if you're going to be positioning DG-87 on the floor, you needn't worry too much about access as EVGA has mirrored some of the controls on the chassis' top-right edge. Here you'll find duplicated power, reset and K-Boost buttons, as well as a pair of USB 2.0 connectors. A good idea, and despite the array of ports and buttons, the exterior doesn't look at all cluttered. The clean lines are further accentuated on the left and rear panels, where the case manages to retain a clean aesthetic with few interruptions. 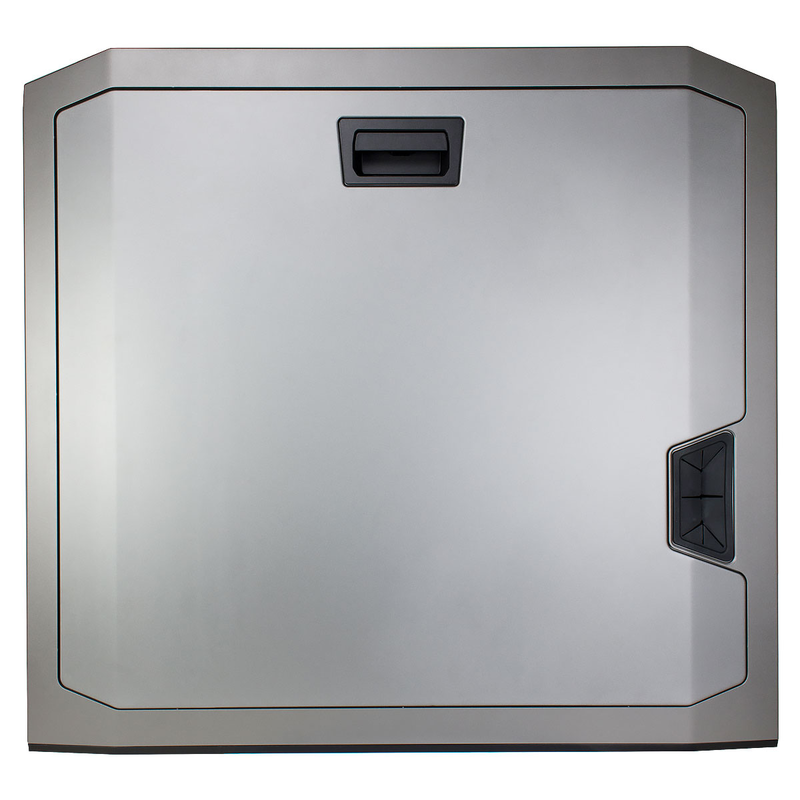 A pop-out plastic cover at the bottom of the left side comes away to reveal access to the power supply bay, while the rear panel is released using a top handle. What's more interesting around back is the rubber-grommeted hole which is used to tidily route cables to the motherboard - it's a neat way of keeping clutter down to a minimum, and if you position the case just right, it can be made to look as though only a power connector is attached. If you've got the space, DG-87 is a great-looking piece of kit and there's plenty of scope for high-end builds. 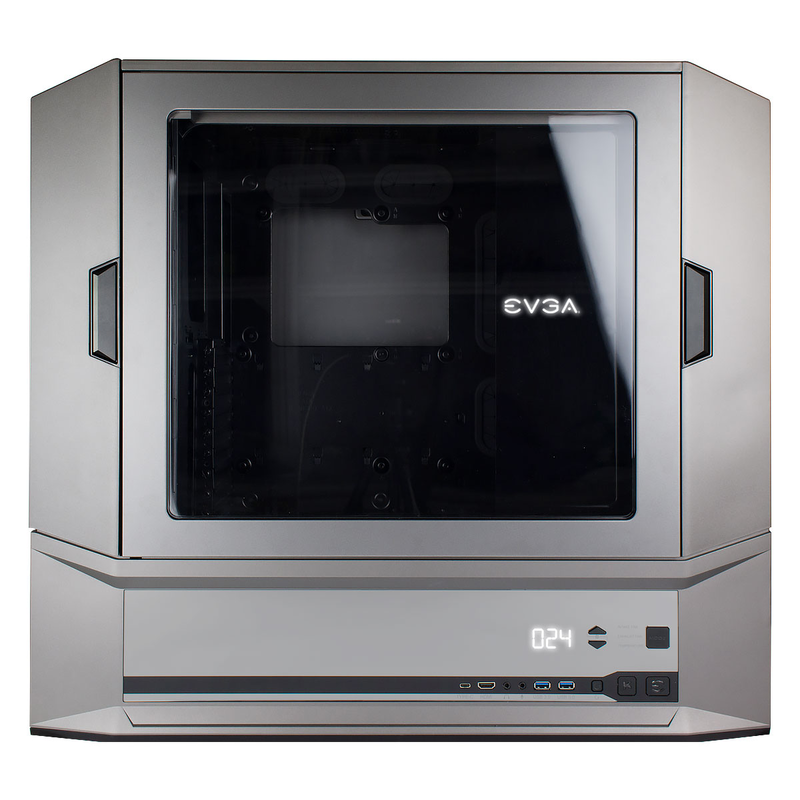 Supported motherboard form factors include mini-ITX, micro-ATX, ATX, extended-ATX, as well as SSI-CEB or EEB. There are provisions for a dozen storage devices (12 x 2.5in or 8 x 3.5in), up to eight fans (six of which are included as standard), and ample space for most liquid-cooling gear. What's perhaps surprising is that there are no 5.25in bays to speak of. This is an omission that's becoming common place on smaller enclosures, where it makes sense to eject optical drives, yet on a case of this size we see no obvious reason not to have built-in DVD or Blu-ray functionality. There's certainly enough space. 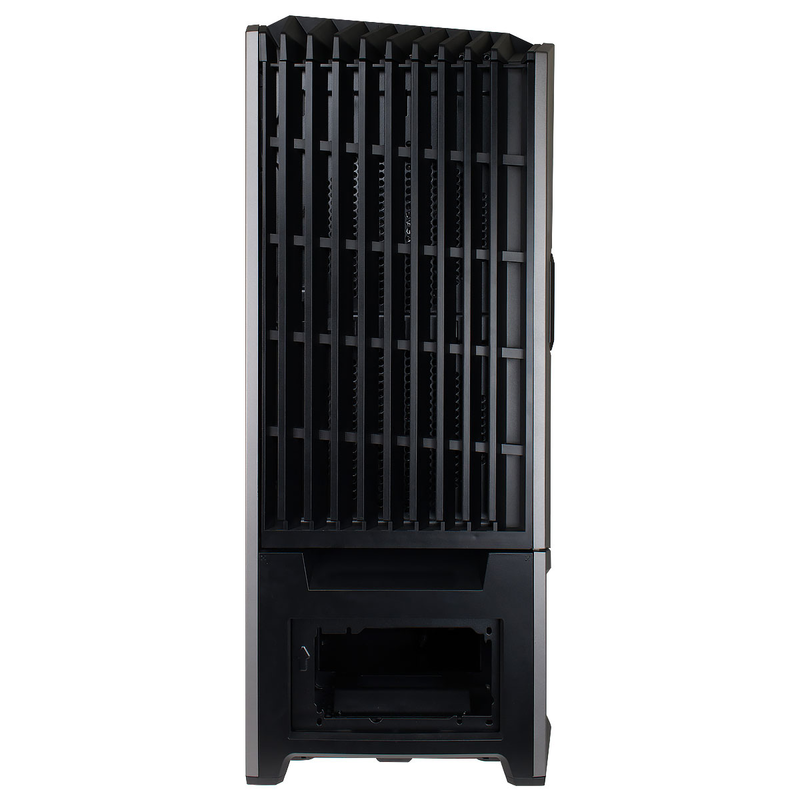 On paper, DG-87 is one of the most enticing full-tower solutions we've seen in recent years. 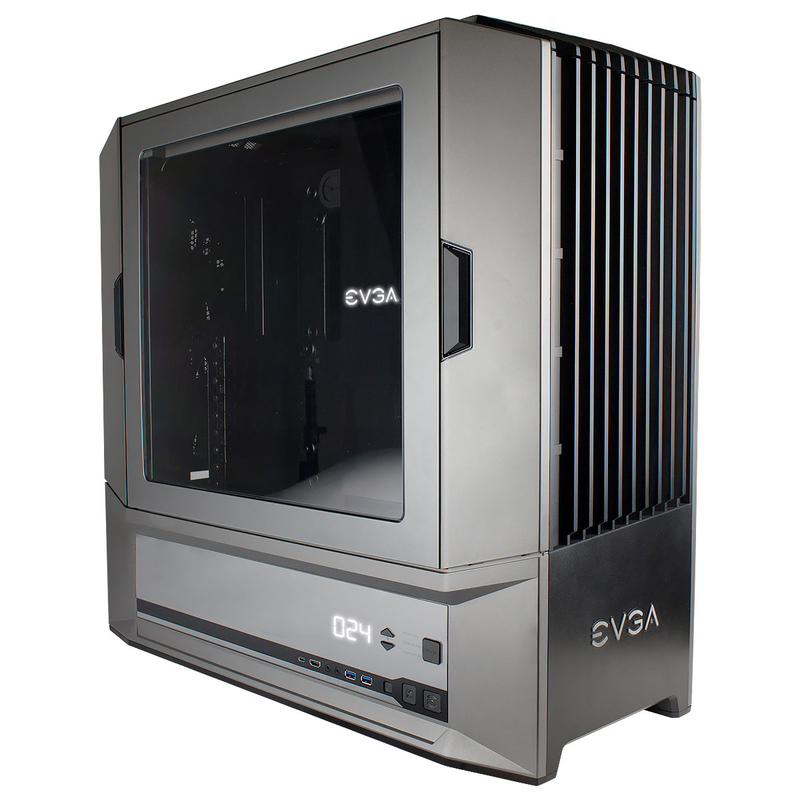 It's relatively affordable compared to, say, a Cooler Master Cosmos, Corsair Obsidian Series 900D or In Win 909, and you'll also be pleased to hear that EVGA has applied its popular three-year warranty to all DG-8-series enclosures. Initial impressions are favourable, but what's the DG-87 like to build into, and how does it fare with respects to cooling performance and noise? Let's find out.